The House Finch is a common bird in Orange County. 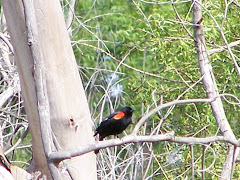 The male has a red head and chest and sings a beautiful song as spring approaches. I love their singing, but as I am listening to one on my patio, I am filled with dread. It is establishing its territory on our patio yet again. House Finch nests are festooned with poop, and they have a high mortality rate. I love them everywhere but on my patio. I hate to clean up after them. Unlike many birds, house finches do not carry the nestlings poop away from the nest or eat it. They leave it like cheery little black and white decorations on the edge of the nest where the fledglings deposit them. They are cute to watch though, and it is exciting when you hear the first little chirps of the nestlings. The female House Sparrow is streaked with brownish gray. She also sings a bit. She is drab enough to be inconspicuous during nesting season. Male House Finch, private residence, Orange County. Notice that the male is slightly streaked below and has lots of red on the head, throat and chest. The male is bright and catches the eye. The male also sings such a beautiful song that people can't help but notice. 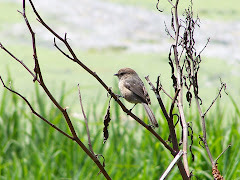 People often ask what bird it is, and are surprised to discover that it is a finch. The color of the male is dependent on the food it eats and can vary from yellow to orange to red. The House Finch and the Purple Finch are similar, but can be told apart by careful observation. The House Finch is more slender and the head is flatter. The Purple Finch is a chubbier bird and has a purplish red all over rather than just on the head and chest like the House Finch. House Finches eat seeds, flowers, fruits, occasional very small insects, and have been know to drink nectar from hummingbird feeders. Male House Finch at San Joaquin Wildlife Sanctuary in Irvine near the Audubon House and the first pond. House Finches are common in areas where we humans dwell. 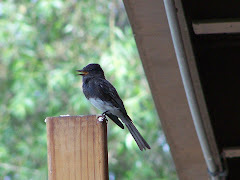 They use our houses and other structures to build their nests and find abundant food in our gardens and green belts. They are also found in other open areas. They are not usually found in dense forests. House Finches are native to the West and to Mexico. They are now also found back east and are moving toward the House Finch population in the West. Who knows when they two will merge? The reason they are in the East is that they were taken there to sell in the 1940's but a law went into effect making it illegal to sell wild birds and so they were released instead of sold. House Finches mate for at least a season and sometimes all year. 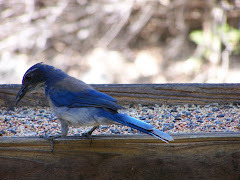 The male displays. Once they pair up, the female builds the nest and broods the young at the beginning of the nesting period. The male brings food. After the nestlings have hatched and are a few days old, the female and the male bring the hungry little birds lots of food. They let their demands be known and chirp up a storm when the parent comes with the food. House Finches are not choosy about their nesting location, but may pick ledges, holes in buildings, attics, or hanging plants. Sometimes they do nest in trees. Mortality rates are high if the nests on my patio are any indication. 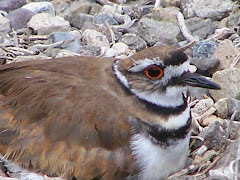 They nest from March through August and can have several broods--not all of which succeed. Some produce no young. House Finches can live up to 10 years in the wild. 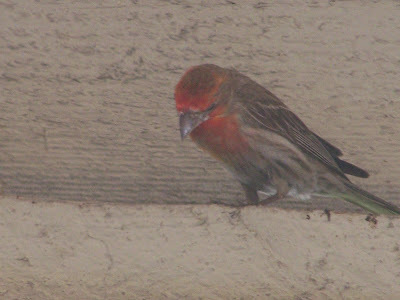 Male House Finch on my patio in Orange County--their favorite nesting spot. House Finches back East are susceptible to conjunctivitis, and while it occurs in the West, it is not as bad as it is in the East. Some speculate the the limited Eastern gene pool is to blame. YouTube Video of Male House Finch singing on a post by the water. You can find House Finches in your own backyard, or in any Orange County Park, including Milesquare Regional Park, Huntington Beach Central Park, Mason Regional Park, and many more. Trees and grass are what they like. 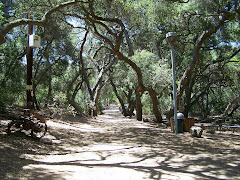 When you are out birdwatching in Orange County, check around and listen for the beautiful and common House Finch. Female House Finch feeding her brood on my patio in Orange County, California. Very thorough article on the House Finch includes information about appearance, range, reproduction, and much more. Photos, maps, sound, and lots of sidebars. Telling the difference between House Finches and Purple Finches. Good article on the House Finch from our neighbors up north, the Seattle Audubon Society. Birding Sonoma County: Purple Finch and House Finch - Learn to tell them apart! Great Article and sketch. This is a terrific blog with great sketches. Very informative. 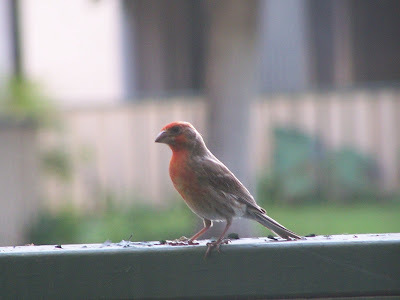 Very short, but good summary with a great picture of a male House Finch. Good photos and discussion of plumage and appearance and history of the species back east. Chipperwood is in Indianapolis, Indiana. The Great Backyard Count: Which Red Finch Is It? Very helpful article that teaches the difference between the House Finch and the Purple Finch and the House Finch and Cassins's Finch. 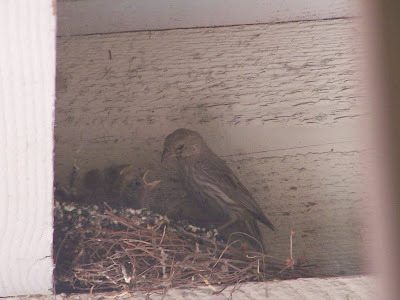 Cute, touching, and sometimes brutal story of a House Finch Couple and their nestlings. Comprehensive page about IDing these similar yet very different birds. Short, but helpful section on the House Finch. What else?